Let the passion for Hockey ignite the passion for learning! "CROSBY SCORES! Sidney Crosby! The Golden Goal! And Canada has a once-in-a-lifetime Olympic Gold!" These words were spoken by play-by-play announcer Chris Cuthbert to more than 22 million Canadians during the 2010 Vancouver Olympics. It's estimated that over 80% of our population watched some part of this epic moment in Canadian history, demonstrating how the nation was unified by hockey. The Hockey Hall of Fame wants your students to celebrate unity and patriotism through the history of Canada's game. Discover how hockey can be used as a tool to captivate students through the Hockey Hall of Fame Education Program. Available in three levels: Junior, Intermediate, and Senior, the Hockey Hall of Fame Education Program is created by teachers, for teachers. Each program features Pre-visit, Hall visit and Post-visit activities that cover a variety of subjects including History, English, Math, Business, and Physical Education. All materials can be printed for classroom use and are free to download. This program was designed to assist you in planning a trip with your class to the Hockey Hall of Fame. The program consists of three sections: Pre-Visit Activities, Hall Visit Activities, and Post-Visit Activities. These activities cover a broad range of curriculum subjects such as Math, Social Studies, Language, and the Arts. The goal of the intermediate program is to provide an arena in which students can utilize critical thinking skills and experience hands-on interactive opportunities that will assure a successful and worthwhile trip. The program covers a variety of subject areas including Language, and Math, and features the Great Moments Scavenger Hunt. Similar to the intermediate and junior programs, the Senior program includes a series of activities created in conjunction with the Ontario curriculum and ministry guidelines. The program also covers a variety of subject areas including English, Phys Ed, Business, Math and features the Great Moments Scavenger Hunt. The Changing Face of Hockey — Diversity in Our Game Education Package pays homage to the pioneers who confronted discrimination from the hockey world through their perseverance, talent, and courage. They have enriched the cultural landscape of hockey and established a tangible forum in which to fight prejudices still faced by many, both in hockey and in life. The education package highlights four significant issues that helped shape today's game: Ethnicity in Hockey, Marginalized People in Top Level Pro Hockey, Women in Hockey and Disabled Hockey. Featuring curriculum based pre-visit, Hall visit and post-visit activities, all FREE for download. An educational highlight to any school visit to the Hockey Hall of Fame! 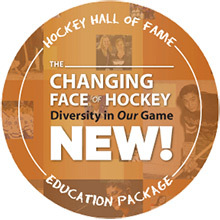 Click here to download The Changing Face of Hockey — Diversity in Our Game Education Package.